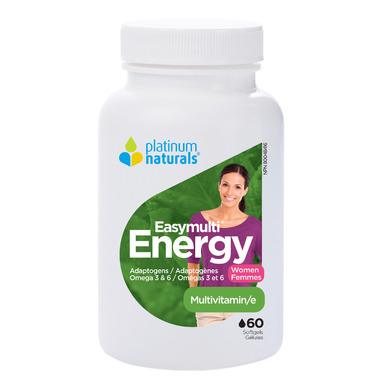 Platinum Easymulti Energy Women is designed to provide increased energy and to help you cope with the stresses of a busy lifestyle. This multisupplement will help you to maintain and improve your general health. It features essential vitamins, minerals, antioxidants, and adaptogens such as rhodiola and cordyceps, Platinum Easymulti Energy Women suspends its nutrients in omega oils for better absorption. Non-Medicinal Ingredients: Sunflower lecithin, beeswax. Capsule Ingredients: Gelatin, glycerin, purified water, chlorophyll. I started it today and rigth away i felt the difference in my body .I feel more energetic I'm glad I found this product. i was tired of feeling with no energy. i would recomend this product to anyon. I did my reserch and it seems a really good quality product. The soft gels are a bit big but easy to swallow. Easy to swallow, natural ingredients and great price! Platinum Naturals makes fabulous vitamins. Easy to swallow and quality ingredients!